In the place where once stood a gothic one-aisle church from the 14th century the architect Eduard Zirm from Vrchlabí built a new neo-gothic church after a design of architect Stephan Tragl from Prague. 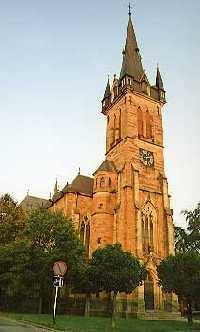 The cathedral was completed in 1889 and consecrated to saint Vavřinec. Three-aisle hall is 30 m long and 18 m wide. Its 60 metres tower raises on the west side above the entrance. On the east side of the cathedral the floor plan is completed into cross shape by a transverse aisle with a presbytery,the addition of the sacristy and the Count’s oratory. The main altar features a statue of the God Father with angels and a sculpture of Jesus Christ. The beautifully coloured windows were manufactured by the Geylings company in Vienna. The Way of the Cross in the three aisles is a valuable woodcarving work of the Stupflesser company from St. Ulrich in Tyrol. The Rieger brothers manufactured the organ in 1889 and equipped it with 22 stops and 2 manuals and an ornate box made of oak wood. Some objects which are among the town's oldest cultural and historical treasures were preserved from the old church and integrated into the new church's interior. 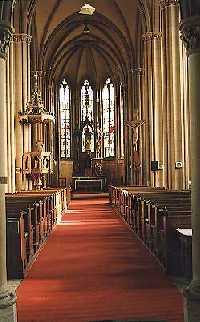 Among these are altar paintings of Saint Ann and Saint Vavřinec. The latter, which can be backdated to the year 1877 is a work of a painter Vilém Kandler from Prague and was once placed on the altar in the original church. A copper font with the inscription "Wer glaubt und getauft ist, wird seelich" (Who believes and is christened will be saved) and a date 1566, is considered to be the church's most valuable object.